Cheese is a food that many healthy eaters crave. Some people add cheese to salads, others layer it on sandwiches and some just enjoy cheese on its own. Either way, cheese provides a creamy flavor that most of us find satisfying. But cheese calories can add up quickly. Some cheese choices are better than others. If you're a cheese lover, then there's good news for you. Not all cheese is bad for your diet. In fact, there are plenty of ways to include cheese in a weight loss or weight maintenance plan. You just need to be careful about what you buy and how much you eat. One of the lowest calorie cheeses is skim mozzarella. A single serving of part skim mozzarella cheese provides just 86 calories, 7 grams of protein and 6 grams of fat. This lower fat, lower calorie cheese is easy to shred or slice, easy to use in recipes and melts well. Many smart dieters also keep skim mozzarella sticks in the refrigerator so that they have a quick protein snack ready to go when cravings hit. Parmesan is another popular cheese among healthy eaters. One tablespoon of shredded Parmesan cheese (from a hard block) provides just 20 calories and 2 grams of protein. And because Parmesan has an intense flavor, it's easy to use less of it on your favorite dish. A single one-ounce serving of Swiss cheese provides just over 100 calories and just under 8 grams of fat. Other popular cheese varieties have calorie counts in the same range, according to USDA data. A single serving of cheddar cheese provides 114 calories, 7 grams of protein and 9 grams of fat. A single serving of American cheese (pasteurized and processed) provides 94 calories, 5 grams of protein and 7 grams of fat. But American cheese calories can be tricky to calculate. Many cheese "singles" are less than one ounce and are likely to provide closer to 71 calories. Cheese calories and nutrition are worse in products that are heavily processed. Why? Because they often contain less healthy ingredients like oil and other fillers to boost texture and flavor. Cheese singles. Many individually-wrapped, processed American singles are not actually cheese, but a cheese-like product that contains oil and other ingredients. Cheese spray. Cheese that comes in a can is only part cheese. If you check the ingredients label on your favorite canned cheese, you'll probably see that it contains oils and other additives. Cheese dips. Many jarred cheese products are made by combining cheese and other ingredients like oil and artificial flavors to make them creamy and spicy. Even though cheese provides saturated fat, when you consume dairy products, like cheese, you gain certain health benefits. Cheese provides both protein and fat to improve satiety or the feeling of fullness and satisfaction you get after eating. In addition, like many dairy products, real cheese is a good source of calcium. Your bones need calcium to stay healthy. Calcium can also contribute to a healthy heart and strong muscles. 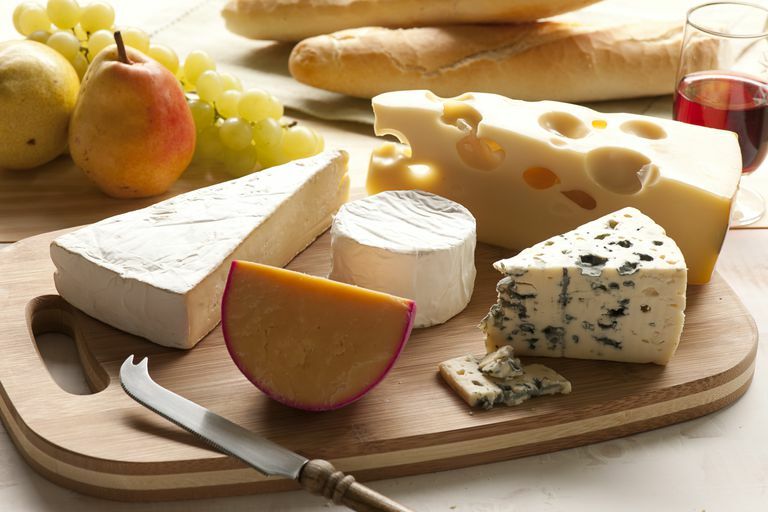 Some studies have shown that eating cheese may be helpful to maintain healthy cholesterol levels. However, most health experts still recommend that you limit your saturated fat intake. Cheese is a source of saturated fat. Lastly, if you are watching your sodium intake, be sure to check the nutrition facts label for cheese before you buy. Some varieties of cheese, like cottage cheese or feta, may provide more sodium than you need. To make sure you keep your cheese calories in control, it's helpful to know that a single serving of cheese is one ounce. That's about one thin slice or two small cubes, roughly the size of a pair of dice. It's easy to serve yourself more than an ounce of cheese, so if you are counting calories or fat, be sure to measure the amount you consume and calculate the right nutritional information for your portion size. And you should still be mindful of calories if you buy low-calorie or low-fat cheese. While some dieters enjoy the taste and texture of these products, they don't always melt well or provide the same creamy texture as full-fat cheese. If you eat more low-calorie cheese in an effort to satisfy your cravings you may end up consuming more fat and calories as a result. And lastly, be smart about the way you eat cheese. Sometimes, it's not the cheese calories that do harm to your diet, but rather the wine, crackers or bread that you consume with the cheese. If you love cheese, consider pairing it with a slice of fresh fruit, to keep your weight loss plan on track. If you're a cheese lover, try a mac & cheese recipe to keep cheese in your healthy diet. Enjoy your cheesy meal with vegetables and fresh fruit to make it more nutritious. Because it is a source of saturated fat, the American Heart Association's Presidential Advisory has evaluated the role of cheese in a heart-healthy diet. They recommend that Americans reduce their intake of all saturated fats, including cheese. In fact, many of us already eat too much of it. If you choose to add cheese to your meal, eat it in moderation. And consider choosing healthier fats when possible to keep your diet, your heart health, and your waistline on track. Goede de, Geleijnse J., et al Effect of cheese consumption on blood lipids: A systematic review and meta-analysis of randomized controlled trials. Nutrition reviews. 2015;73(5):259–75. National Institutes of Health. Healthy eating, food exchange lists. Nilsen R, Høstmark AT, Haug A. Effect of a high intake of cheese on cholesterol and metabolic syndrome: Results of a randomized trial. 2015;59. Thorning T, Razian F., et al Diets with high-fat cheese, high-fat meat, or carbohydrate on cardiovascular risk markers in overweight postmenopausal women: A randomized crossover trial. The American journal of clinical nutrition. 2015;102(3):573–81.